"Oxyfly is extremely easy to use and much more practical than oxygen bottles. For us, small oxygen bottles are not a viable alternative because we often fly long distances and require oxygen supply during up to 5 hours for 2-4 persons. Oxyfly overcomes all these drawbacks, ensuring a continuous supply of oxygen, full autonomy and considerable time saving. In addition, the oxygen produced by Oxyfly is much more pleasant to breath compared with the oxygen bottles. After using Oxyfly it would be impossible for me to go back to the oxygen bottles." Previously a daring pilot of aircraft without pressure cabin was on his way in altitudes up to approx. 10.000 feet. Above this height the crew and passengers got problems like slight dizziness, general tiredness and poor concentration. Unwell feeling started to spread. We all know the feeling of being groggy and somehow whobbly on ones feet after long distance flights in /above an FL 80 . As an alternative (even if reluctantly) it had been made use of a conventional oxygen system with all typical and well-known disadvantages. : Bottle always empty when needed and of course no possibility in the vicinity to fill up and even if possible …it takes a lot of time to fill up and is very expensive at some places. Bottled oxygen is horribly cold and dry so longer application leads to a scratchy feeling in the throat. .And the on-board “crush” oxygen is, of course, limited in volume. This problem concerns all pilots and passengers of unpressurized aircraft, starting from the 152 type Cessna up to the 50-seats aircraft of the type Shorts SD360. The 1. level , meaning the altitude range from 10.000 – 20.000 ft., was reserved for the operators of “real” aircraft. In Abu Dhabi, a big aviation exhibition takes place regularly. The supreme command of Vulcanair ( airplane manufacturer, espescially known for the P68 Observer-airplanes) decided that a participation at this location would be highly welcome. The pre-production prototype of the new turboprop aviator should be transferred for this holy purpose – if possible before yesterday The company owner refrained selflessly from flying with the crew by pointing out the weight and better performance, they preferred to undergo the inconvenience of an ordinary business class flight. As in future the new aviator models of Vulcanair will be equipped with an OXYFLY oxygen-module from Dürr as standard, there was already one of this device in that aviator which had to be transferred. A box-shaped carrier skeleton of well-made aluminium in the size of a medium pilot case contains the components of the OXYFLY. The interested reader of these lines may ask himself – how does this wonder device work ? The operation is pilot-friendly simple, On – off. In the standard version of the P68 TP-Aviator, the OXYFLY is activated easily from the cockpit, the power circuit, is, of course, separately fused. So, from where does the oxygen come from, how is it generated on spot ? The system is actually already known for a long time and originates from the medical technology (oxygen separation). 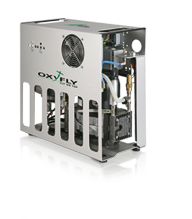 The OXYFLY extracts the air off the aircraft cabin and sends this by an espescially developed oil-free compressor through a filter unit. Here, nitrogen and oxygen are separated , the oxygen is transported via flexible lines to the crew and the passengers. The higher one flys, respectively the more oxygen is required, the stronger the brushless-operated special compressor is working. The filter unit must not be exchanged before 4000 hours (!) . Up to 6 persons have unlimited storage of oxygen owing to the OXYFLY, as long as the generator(s) supply power. At our flight from the manufacturer’s work in Naples to Abu Dhabi we were three persons on board. One mechanic from Vulcanair, as crew, Yves, the manager of the French subsidiary of Vulcanair, such as myself. The cabin of the 8-seats aircraft was fully packed with material and spare parts for the aircrafts of a local surveying company. The OXYFLYcorresponded to the latest version 2013, the installation in the aircraft was still provisional, there were four offtake points positioned. Dürr Technik has optimized the OXYFLY for up to 6 persons and an altitude of up to 18.000 ft. The power consumption of the compressor has been reduced in the course of the product development and is presently at a very tolerable rate of 15 A in full-load. As the Vulcanair-aircrafts have generously dimensioned generators (the piston version P68-C has 2 x 130 A!) plentiful provisions are made. After take-off in LIRN we switched on the OXYFLY after ascending of 8.000 ft.and hinged down the very comfortable Oxyarm cannulas on the side of the Headset. Talking, eating, drinking etc. works without hindrance in contrast to using the mask. The sound of the OXYFLY was not perceptible for us during the flight, when being on ground / standing the noise level is comparable with a little espresso machine, nothing more to hear than a quiet “ Brrrrr“ . After having carried out the first legs on flight level 180, we became aware which advantage by using the Oxyfly has been offered to us in reality. 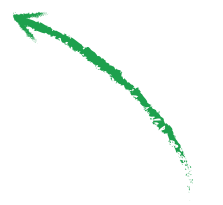 :We suddenly have an additional height spectrum of 8.000 ft. without a resulting loss of comfort! More flexibility with regards to circumventing of weather conditions, taking advantage of stronger tailwinds and reduced consumption of fuel/cerosin go together with a significantly higher TAS and therefore shorter operating times. A profit across the board. We were considerably less tired and exhausted compared to flights of similar lengths. At the next legs we simply switched on the OXYFLY directly after the Take-Off, and switched it off only after landing. The oxygen is practically “for free”. We also learned from other users of the OXYFLY, that they make use of the oxygene already quite early, as the general condition is simply better. At our transfer-flight which took mainly place in the area of FL 170-180 , we used ,as an additional control, the Pulse-Oxymeter offered by the company Dürr Technik. This little battery-operated device can be clamped for a short period to ones finger, the oxygen saturation of the blood is photometrically measured here and directly indicated. Our values were between 94 and 98 % haemoglobin saturation, thus, in other words – everything “ in the clear”. We all found it very pleasant, that the oxygen supplied by the OXYFLY has a higher temperature and humidity due to the compression than the bottle oxygen. No scratchy throat, no cold syndrome – nothing. In my opinion, the OXYFLY is a real enrichment with regards to the safety sector and the comfort zone. The old oxygen bottles at Vulcanair do now end up in the waste metal, and it will be flown more often in the 1. level. How long have you tested the new OXYFLY system and what was your experience? Do you notice some differences between using normal oxygen bottles or using the OXYFLY system? How long does it take to refill the oxygen bottles? At last what about the price? Abridged version - printed by kindly courtesy of Mr Stuart.